B.O.S.S. — Two Hunters, Chapter 9 and Publishing news! 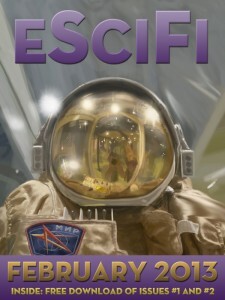 A bit of exciting news for me: My short story, The Wind and Sky is a serial in the e-magazine ESci-Fi! The February issue features Wind and Sky Part 1 — Disgrace. Part 2 will likely follow in a future issue. Wind and Sky will be still featured here on MOD a month after the release in ESci-Fi. I highly recommend checking out. The other Ezines on E-fiction if you want some quality short stories. Fantasy is my primary focus of course, but my roots come from Sci-Fi. I suppose the apple doesn’t fall far from the tree as I grew up around Trekkies and Starwars junkies alike. Wind and Sky is a story of two nations divided by war. They shelter a terrible secret that may guide the fates of both countries. I am very excited to share this tale with you since I’ve made everyone wait so patiently for my main project, Dimanagul. The weekly posts will continue. Wednesday will be a quirky midweek post and Fridays will be the B.O.S.S. series stories. As always feel free to make requests in comments or just say hello. I credit all of this to the inspiration you, my readers have given me. For now, enjoy the final ‘love’ story of the month. Nell Draadich in Two hunters Chapter 9. An impermeable gloom hung over Nell. She pulled breaths shallow yet deliberate as to not aggravate the hairline fracture across her heart. Sonnie watched ‘Lady Tusche’ leave with piqued interest. Nell could at least embrace his obliviousness as a small silver lining. Once again it had come down to her failures. Magic proved a very fickle thing. It could be deceived as any man could be. Wording could be twisted so an ally would become a foe. This fundamental of magic often orchestrated her undoing. Of all the elements, none acted more fickle than flame. In her time in the Academy she had been gently pushed from the element and urged towards magic of the Earth. Earth magic acted as a wise teacher. It acted stubborn and difficult, but it also remained stalwart and honest. There was no trickery involved. It played a game of successes and failures. For Nell however, the world could never be so black and white. Nell frowned at him. There were many things she knew she could do with Sonnie Daie and trust was not one of them. But she had no choice. She nodded quietly in response. “B… But no one has laid eyes on the current Arch Lich…” Nell’s gloom lifted a little. Sonnie’s drive might have been insane but it seemed well meant. Dealing with a Lich meant death or undeath. The living repulsed them. They acted as the pure essence of death manifested by mass culminations of blight and suffering. Ironic that the top of the Undead food chain wasn’t an undead at all. They were what caused men to become undead. They were the root of the problem. Any lead to slay a Lich, even if it meant throwing your life away to earn information on one, proved paramount for a hunter. “For you of course. I’ll help you rid the continent of undeath if it means having you.” He easied her through the crowds, his expression soft and honest. Truth lingered in his stare. This scared her more than any lie he had ever crafted. Nell did not understand. She tried to make the connection of this claims and Dreamweaving. Did he think he could control the Lich? That proved insane. Sonnie’s hand lingered in front her face. A solitary finger pointed skyward. “Allow me to demonstrate.” Sonnie smirked. Nell’s face flushed deep red. All eyes were on her despite his words. “I stand before you today to perform a miracle.” Sonnie held his hands out regally and beckoned more people to gather around. He draped an arm around Nell and gestured to her. “W…what?” Nell’s eyes grew wide. “Confirm my claim.” Sonnie frowned. “I’m not a s…street performer!” Nell said, mortified. “Do it.” Sonnie said with a whisper of threat. “F…Fine…” Nell raised her archwand and crafted an orb of flame. It spun and crackled inches over the head of her staff. Nell hated using her magic more than anything in a crowd. She could not see it as sharing a gift, but rather exploiting a trusted friend. The people around her offered gentle applause. Each clash of hands, a mockery of her gift. Nell quickly extinguished the flame and offered a cool glare at Sonnie. “Now with that said. This woman is also stricken with a malady of the heart. She lacks confidence.” Sonnie offered a smug grin. Nell’s shoulders sagged and the glare fell from her face. Humiliation? This was his gift of love? The gathered people reacted in and array of chuckles, blank stares and cat calls. Nell opened her mouth to speak, but found herself transfixed on his finger. He slid it back and forth in front of her and the world around it fell to a murky haze. Her doubt and fears choked her like a thick fog. It prevented her from action and acted as invisible shackles. Her eyes fell shut and Culvir’s scowling face came into view. He didn’t have faith in her either. He only saw her as an obstacle to his plans. Culvir had managed to trick her and her magic and moved to his own devices to solving the matters with the Vampires without breaking the rules set by Sonnie or herself. Rage boiled within her. She only thought of his best interests. The murmers of people around her made her angry. The lies, the masks: everyone around her played this cruel game. She realized then, the thoughts were all in Sonnies’ harsh voice. He directed this rage but made no attempt to directly control it. It acted outside of Dreamweaving. This understanding of her being proved something only Sonnie could do because he knew her. Her doubts were as well as spelled out on paper to him. This power of understanding strengthened her. Nell’s eyes opened. Her focus clear and free of haze. Her body felt light and unimpeded. The people muttered around her sounded as it should, simple noise. She knew this focus, she had endured it before. When she drank and the haze of alcohol pushed away those fears she attained this confidence. She had to know, she had to see if it was the same. Nell let her Archwand slip from her fingers. It acted as the symbol of her weakness and false power. It clattered to the ground and her hands raised shoulder length apart. Flame erupted between her fingers and engulfed her hands and arms. Sonnie took a measured step back while others stumbled to flee. The flame did nothing to burn Nell. It would never betray her. Flame was a thing crafted from lies and fickle winds… but to her it proved nothing less than family. She focused and contained the swirling ball of rage. It’s furor sent her hair aflutter like a silver cape. She cast a hand skyward sending the flame upwards, traced the by eyes of spectators. It burst and erupted into a veritable sun, dangerous and barely contained. Nell’s eyes stayed transfixed on it. The threat clear, but Nell shaped it with calm controlled actions. Every wisp of flame served her and her alone. This trust acted as an unshakable absolute. A smile came to her typically sullen face. How could she doubt herself with such a powerful ally? : Fire Absolute. Nell clapped her hands together and the sun above extinguished. The light from the flame lingered a brief moment as the marketplace looked skyward in stunned awe. Nell looked at her hands idly. The confidence lingered, not fleeting in the slightest. This feeling struck her as natural, her true self. Nell turned to Sonnie, her chest tightened. He did not control her, he has simply freed her. He was right: this was not Dreamweaving. This could only be seen as a boon. “Now, let’s be fair… This woman is extraordinary. I do not promise you power over flame. But I can promise you similar results to regaining control over your lives.” Sonnie gave Nell a one armed hug. Nell let him. He had done her a great favor. In fact he had earned much more than tolerance. The urge to kiss him welled up inside of her. If he could do this… then the war against the undead would soon be over. They had a clear hope of winning. Sonnie Daie’s cruel brilliance had brought them this. If his only expectation was her devotion. He would have it.